AirMedCare Network member Sarah McLen received a phone call on January 31, 2016. The voice on the end of the line said, “Sarah, this is Monte. Are you close?” Sarah’s husband, Frank, had been in a motorcycle accident. A truck ran him off the road at a steep curve. He went through a pasture with numerous trees before hitting a mattress that threw him into a new barbed wire fence and some brush. EMS took Frank to Hendricks Health System in Abilene. 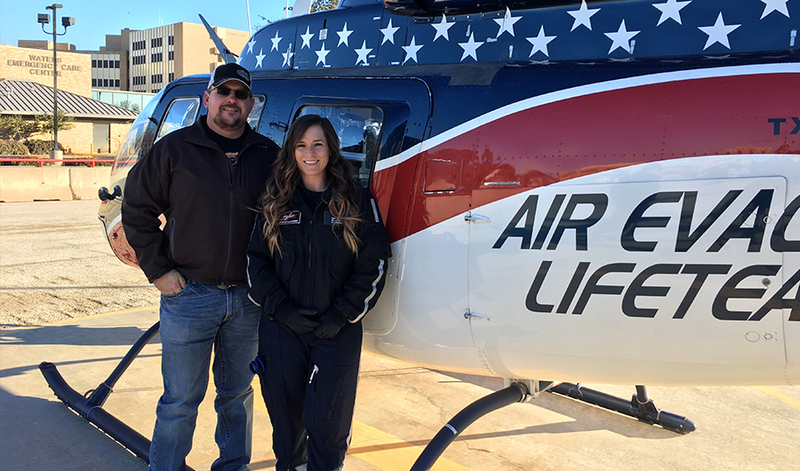 Because of the extent of his injuries, Air Evac Lifeteam was called to fly Frank to University Medical Center in Lubbock —a Level 1 trauma center. Frank suffered a skull fracture and had a brain bleed. His left orbital socket was fractured in several places, along with broken ribs and vertebrae. Frank also had a deep gash on his forearm, which separated his skin from the muscle. Sarah also praised the Air Evac team that transported Frank, and the patient accounts team that worked with her following the accident.